Amid all this, the greatest fear for mothers of boys was that their sons would be taken away. The age at which boys were transferred to men's camps dropped from 15 at the start of the war, to 13 then 11, until by 1944 boys of 10 were being transported. As they waited to climb on to the lorries they would cling to their mothers, not knowing whether they'd ever see them again. By the time liberation came on 15 August 1945, the degradation of these women was complete. Like the POWs in their loin cloths, they had virtually no clothes, many wearing old tea towels for bras, and "sandals" fashioned out of strips of rubber tyres. Like the POWs they were skeletally thin, half-blind with malnutrition and, as with the POWs, huge numbers had died. I have no wish to diminish the heroic Prisoners of War that Flanagan has written about with such brilliance, or ever to forget what they endured. But thousands of women and children also lived with hunger, disease, cruelty and death, and we should remember their ordeal, and their courage, too. With such chronic overcrowding, poor sanitation was the norm, and dysentery and typhus flourished, along with scabies, bedbugs and lice. Education was banned - children would write their numbers with a stick in the dirt - and females aged between 11 and 60 all had to do "useful work". Many women were "furniture ladies", whose job was to empty houses of furniture, then take it to another, already emptied house, for the future use of the Japanese. Working in pairs, they would lift tables, cupboards and even pianos on to a "buffalo" cart. But instead of the cart being pulled by a buffalo the women would have to put on the harness and haul it themselves. Others worked in the dapur or central kitchen where they would chop firewood and scrub the old oil barrels that were used as giant saucepans. Some repaired the hated gedek - the fence - while others had to scoop sewage out of the overflowing latrines or make coffins for the ever increasing number of dead. In addition to this distressing, undignified and exhausting work, the women were subjected to constant brutality. To look a soldier in the eye, or fail to bow to him instantly would incur a vicious slapping that could break a nose, or loosen teeth. At Tenko, or roll call, which took place twice a day, the internees had to stand for hours in the blazing sun, with no hats allowed and not even the elderly or children allowed to sit down. Once Japan had conquered South-East Asia, the Europeans, Americans and Australians who had been living there as planters, teachers, missionaries and civil servants were rounded up and trucked away to the 300 "civilian assembly areas" - in reality concentration camps - that the Japanese had created. Ten thousand British were interned in China, Singapore and Hong Kong, while 3,000 Americans were interned in the Philippines, at Santo Tomas. By far the largest group were the 108,000 Dutch civilians, 62,000 of them women and children, who were sent to camps on Java, Sumatra, Borneo and Timor. Their ordeal was to last three and half years and would claim the lives of 13,000, due to starvation, exhaustion and disease. Yet when I published my novel, Ghostwritten, about the internment on Java of a Dutch girl and her family, the most frequent response from readers to this part of wartime history was: "I had never heard about this." You have to be over 45 to remember the 1980s TV drama, Tenko, about a group of British and Australian women interned in a camp on Sumatra, which is also the setting for the 1997 film, Paradise Road, about American and Dutch women struggling to survive in a camp in Palembang. Richard Flanagan's The Narrow Road to the Deep North has won this year's Man Booker Prize. But there's more to the "war in the East" than the horrors of the Burma railway says novelist Isabel Wolff. The Narrow Road to the Deep North is a magnificent novel and a worthy winner of the Man Booker Prize. Its story of Tasmanian army surgeon Dorrigo Evans and his fight to save the men under his command from starvation, disease, and the relentless brutality of their Japanese captors, will stay with me for the rest of my life. The book is a powerful addition to the canon of films and literature that dramatise the horrors of life as a POW in the Pacific War. Bridge On the River Kwai, Merry Christmas Mr Lawrence, The Railway Man and the soon-to-be-released Unbroken, about the Olympic runner and Japanese camp survivor, Louis Zamperini, all focus on the suffering of Allied soldiers in the Far East. Indeed, when we reflect on that part of World War Two we think, automatically, of these brave military men, of whom there were 132,000. Yet there were 130,000 Allied civilians in the region - predominantly women and children - who also endured appalling privation and cruelty, but whose story is barely known. But where the Thai-Burma Railway continues to fascinate writers and historians, with two Hollywood films and a major novel this year alone, there's little awareness of what the civilians endured. For most, a near paradisal life in the tropics had come to an abrupt end with the Japanese attacks on Pearl Harbour in December 1941, followed soon after by the Fall of Singapore. While the Allied troops were sent to slave on construction projects in Burma, Singapore and Japan, the civilians were imprisoned in what were, for the most part, segregated camps. The men's camps, for men and boys over the age of 15, were in former government buildings and disused barracks, while the women and children's camps were fenced-off areas of cities such as Batavia (now Jakarta) and Bandung. In camps like these women and children were crammed, 50 or 60 at a time, into houses that would normally have accommodated one family. 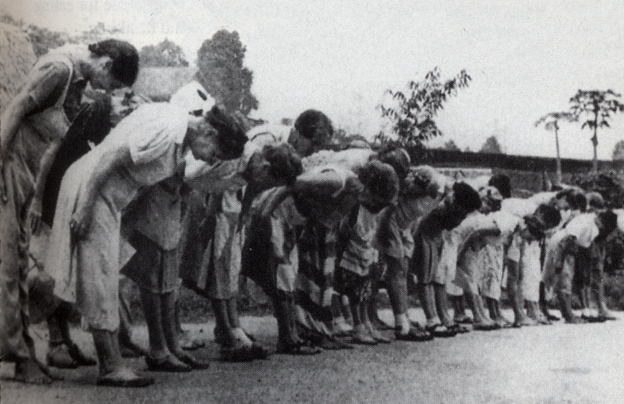 UK Deputy Prime Minister Nick Clegg's mother, Hermance, was in Camp Tjideng in Batavia, with her mother and sisters. She remembers having to bow deeply towards Japan at Tenko, "with our little fingers on the side seams of our skirt. If we did not do it properly we were beaten." Another punishment, head shaving, was so common that the women would simply wrap a scarf round their bloodied scalp and carry on. Worse even than these sanctions was the fear of starvation as the rations of what passed for food - tapioca gruel - dwindled to half a cup per person a day. Desperate to keep their children alive, women would catch frogs, lizards and snails and boil them in a tin cup on the back of their irons. The more daring risked being savagely beaten or even executed, as they crept to the gedek to trade their meagre possessions with local people for a banana or a couple of eggs. The internees became so obsessed with food that they would feverishly swap recipes, writing out the ingredients, discussing the method then mentally savouring the delicious dish that they would never get to eat.